Back in Ayodhya Dasaratha had died of grief. Bharata and his brother Satrughna who had been visiting an uncle had returned to Ayodhya on hearing of their father's death. Bharata in particular was horrified at what his mother had done. He refused to be installed as king and resolved to find Rama and bring him back to Ayodhya. He set off with the foremost citizens of the city and a huge army and has reached the banks of the Ganges in Guha's kingdom. 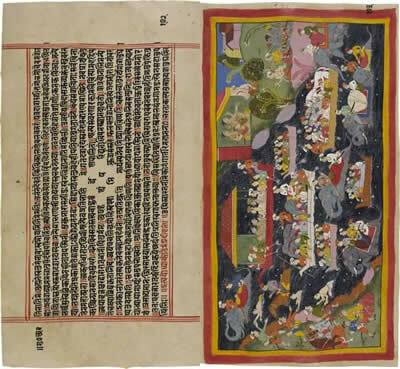 Bharata tells Guha to fetch enough boats to convey them all over the Ganges. They all then cross the river in flat-bottomed boats driven by paddles and with steersmen with long poles. The largest boat, in which are the princes, the Brahmins and their advisers, has a canopy and also a screen for the queens. Others convey the horses and army, while the elephants with their baggage are driven across by their mahouts. Some men swim across and are helped out of the water by Guha's people on the far bank. The two princes have now resolved to wear ascetics' garments like their exiled brothers.